You might wonder why the Wisconsin Historical Society owns this collection of nearly four hundred photographs that document Native American agencies, schools, and reservations, none of which are in Wisconsin. It makes more sense when you know that the images were acquired by William Arthur Jones, a resident of Mineral Point, Wisconsin, from 1851 until his death in 1912. Jones was prominent in local and state business and politics, and served as U.S. Commissioner of Indian Affairs from 1897 to 1905. These photographs were taken under his jurisdiction by photographers such as Thomas Croft, H.H. Bratley, G.W. Parsons and Frank A. Rinehart. They are part of our collection of his papers, which relate mostly to his federal office, with a few concerning his Wisconsin business ventures. Of major interest within the photographs collected by Commissioner Jones are the large number showing school and agency buildings, various types of dwellings, pupils in posed groups and engaged in vocational training, and dancers, agricultural workers and cowboys. 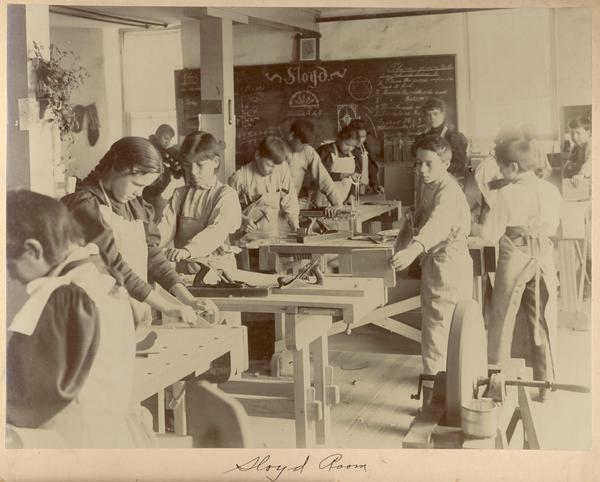 Many of the school and reservation images provide insight into the federal government’s attempt to "civilize" Native Americans, especially through the education of Indian children. One event documented is the Ojibwa-Pillager Battle, which took place in 1898 at Sugar Point on Bear Island, Minnesota, the result of a dispute between the Ojibwa-Pillager tribe and the federal government over timber sales. Another cause was the objection of the Ojibwa to the practice of several United States marshals furnishing liquor to the Indians and then arresting them in order to collect fines. The Trans-Mississippi Exposition and Indian Congress - held in Omaha, Nebraska from June through November 1898 - was intended to show the traditions and customs of Native Americans to the general public. Subjects photographed include Indian participants and their exhibits, the opening dance, tepees, canoe construction, meal preparation, and the use of bows and arrows, as well as photographs of individuals and groups in their traditional dress. A few images document the participation of Native Americans in Troop L of Theodore Roosevelt’s Rough Riders during the Spanish-American War. Both the papers and the photographs of William A. Jones were donated to the Society in 1978 by the late Robert Neal, Mineral Point resident and local historian, whose more noteworthy accomplishment was buying an old Cornish stone house to rescue it from demolition. After years of careful restoration by him, it became Pendarvis, one of the nine Historic Sites of the Wisconsin Historical Society. William Arthur Jones was born in Pembrokeshire, Wales, 27 September 1844, and immigrated in 1851 with his parents (John P. and Phoebe Davies Jones), who settled on a farm along the Pecatonica River in what was known as the "Welsh Settlement" about 5 miles from Mineral Point, Iowa County, in southwestern Wisconsin. William graduated from Platteville Normal School (1872), taught school for several years, then studied law and was admitted to the bar, but never practiced. He was elected superintendent of schools for Iowa County (1877-1881). In 1881, at the age of 37, he married schoolteacher Sarah C. Ansley; they had four children: Agnes, William A., Florence, and Marian. The family attended the Presbyterian Church and Jones was a member of the Masonic Order, serving as treasurer of the Mineral Point Commandery. In 1881 William A. Jones also entered the banking business, and in 1884 was one of the organizers of the First National Bank of Mineral Point, for which he was cashier and later secretary and vice-president for several years. 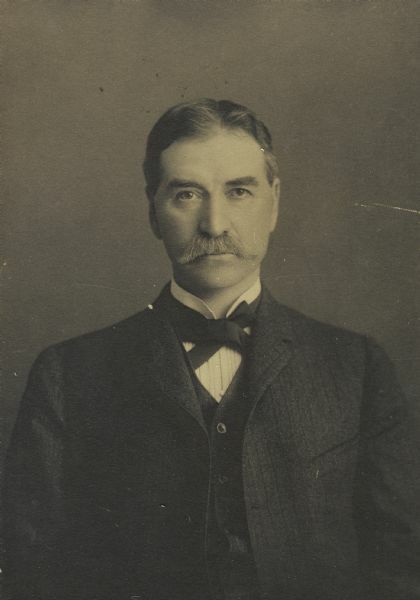 A Republican, Jones was mayor of Mineral Point (1884) and a state assemblyman (1895-1898). With his brothers, David Benton Jones and Thomas Davies Jones, both of whom were Princeton graduates and prominent Illinois attorneys, William purchased the Mineral Point Zinc Co. in 1883. The company was reorganized with David Jones as president, Thomas as vice-president, and William as secretary-treasurer, and soon was established on a paying basis. In 1897 the company became affiliated with the New Jersey Zinc Co., one of the largest zinc producers in the U.S., and made extensive land purchases in southwestern Wisconsin for mining purposes. Although William’s brothers moved to Chicago, he remained a resident of Mineral Point. He was secretary-treasurer of the Mineral Point Zinc Co. from 1887 to 1897. In 1897 he was appointed U.S. Commissioner of Indian Affairs by President McKinley, and served in this capacity until January 1905. 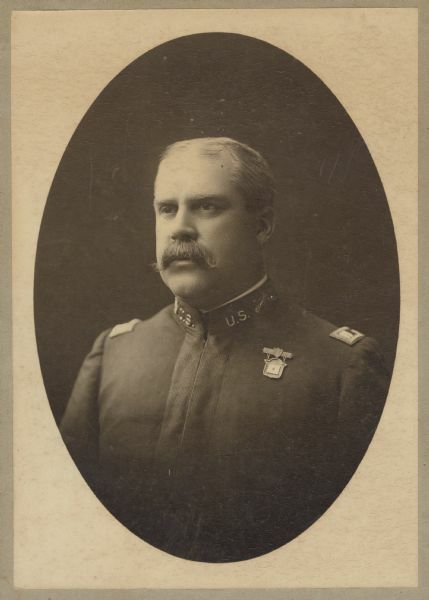 Then he was general manager of the Mineral Point Zinc Co. (1905-1912), served as western manager of the New Jersey Zinc Co., and was also superintendent and general manager of the Mineral Point and Northern R.R. (1905-1912). Late in 1906 the family moved into a grand new home at 215 Ridge Street in Mineral Point. William A. Jones died there 17 September 1912 at age 68. After a few years his wife and children moved to Chicago, leaving the mansion unoccupied and well-maintained by a family trust until it was sold in 1985, in pristine condition. Today it is a popular Bed & Breakfast and Retreat Center.